As you’re all more than well aware, fall is my favorite season. I love just about everything this lovely time of year has to offer—from pumpkin-flavored pastries and chilly air, to sweater weather and the promise of Thanksgiving and Christmas just around the corner. That said, I know it’s not everyone’s cup of tea. My sister, for example, can’t stand fall (she’s a summer gal through and through). 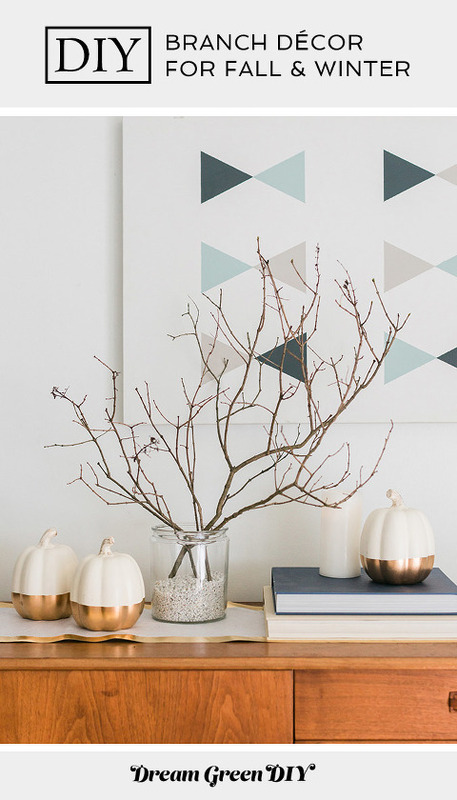 If you agree, then the idea of fall décor might sound like a huge chore or something you just can’t get pumped about. I get it! The awesome thing about this season, though, is that it doesn’t take much to decorate around. 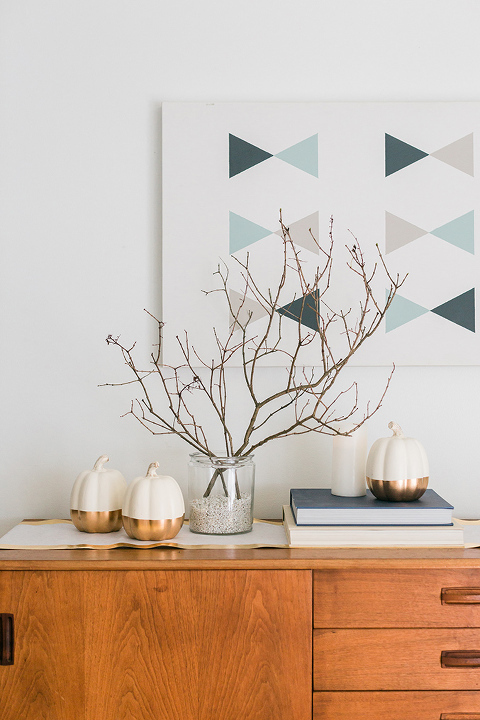 You saw just last week how I updated our dining room for fall, right? Well, I’m back today with a couldn’t-be-quicker seasonal arrangement that anyone can do using practically all free materials. It really hardly even warrants the word “tutorial,” but I just couldn’t leave well enough alone, so I’m explaining my DIY branch décor for fall (and winter!) below. All you need to recreate the look is a large glass jar (I ordered mine here), some pebbles, and leaf-less branches. First, dump your rocks into the basin of the jar. My pebbles were purchased on clearance from Target, but I’ve used gravel from our front garden beds before for similar arrangements, so feel free to use what you have on hand. Then, you can push the ends of your branches down into the pebbles until they’re deep enough to stay put. I think the key here (and what I didn’t have time to talk about in my post from last week) is that it’s best to use big branches. 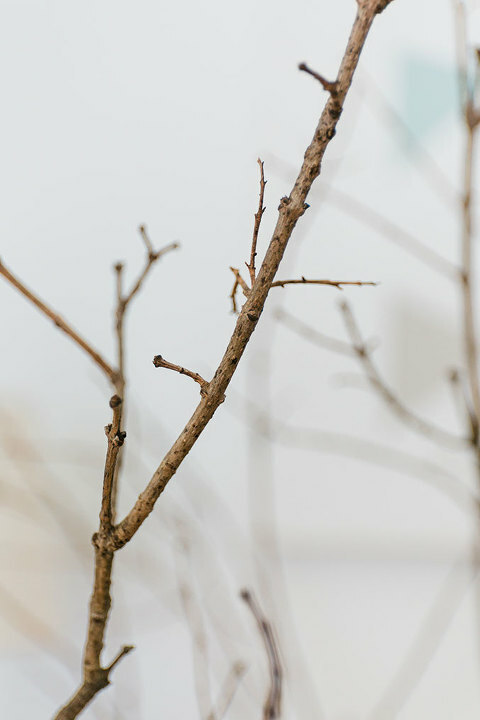 Small branches might end up looking a little dinky, so try cutting down or choosing fallen branches that are extra full. You can always trim them a bit or remove scraggly branches once you’re inside and working on the arrangement. I personally love an asymmetrical look, so I snipped down two different sized branches from a tree in our yard, and layered them on opposite sides from one another in the jar. When in doubt, look for branches that are longer than your arms to ensure lots of sculptural height. This arrangement was actually an afterthought while I was decorating our dining room for fall, but it’s now unexpectedly my favorite part of the whole room. I love that it’s so eye-catching, and I especially love that it was free since I was able to use materials we already had handy. Stay tuned next week for another DIY tutorial that shows you how to remix this arrangement specifically for Thanksgiving—I can’t wait to share! **Don’t forget to sign up for the Dream Green DIY newsletter! The next issue hits everyone’s inboxes tomorrow, and will include a big list of our favorite DIY Halloween costume ideas from across the web. Sign up here!